In this post, we briefly discuss the architecture behind the React Native framework, giving a high-level overview of what makes it go. Let’s take a look at one screen from an app that is purely React Native and ask ourselves what is the UI that we see here. Is this HTML? Is this a webview like other implementations in PhoneGap or Cordova? The answer is, without a doubt, no. 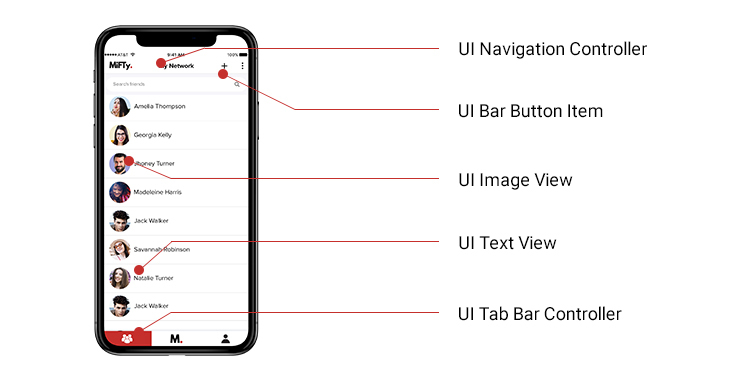 The views in React Native are purely native views so, from our app, the navigation controller that you see here at the top bar is the UINavigationController. Now, if you are an iOS developer, you would see these are the same UI views that you use in your native apps. In the native realm, you still develop in Objective-C and/or Swift if you are on iOS or with Java if you are on Android. You use the native, platform-specific languages that you used before and you have the main UI thread as usual. In all platforms, you can usually change the UI only from the main UI thread and you can create as many background threads as you want.